1 Score the surface of the steak with 1/4 inch deep knife cuts, about an inch apart, across the grain of the meat. Combine the marinade ingredients. Place steak and marinade ingredients in a large freezer bag. Coat the steak well with the marinade. Seal the bag and place in a bowl. Chill and marinate for at least 2 hours and up to overnight. 2 Using olive oil soaked onto a paper towel, coat the grill rack of your grill with olive oil. Preheat the grill with high, direct heat. The grill is hot enough when you hold your hand about an inch over it and you can only hold it there for about a second. 3 Take the steak out of the marinade bag and sprinkle generously on all sides with coarse salt and freshly ground pepper. The salt and pepper will help form a savory crust on the steak. Place steak on the hot grill. If you are using a gas grill, cover the grill. Grill for 4-6 minutes on each side. Half way through grilling on each side, turn the steak 90° so that you get more grill marks. How do you know if the steak is done? The best way to tell is to poke it with your finger tips. While the steak is still raw, test it with your fingers; it will be quite squishy. That’s what a very rare steak feels like. As the steak cooks the muscles contract and firm up. Touch the tip of your nose and that’s what a very well done steak feels like. Here’s a visual guide, the finger test to check the doneness of steak. 4 Flank steak is best eaten medium rare; well done will make it too tough. When the steak has cooked to your preferred level of doneness, remove from the grill and place on a cutting board. Cover with aluminum foil to hold in the heat and to keep the steak from drying out, and let rest for 10 minutes. 5 Make very thin slices, against the grain, and at a slight diagonal so that the slices are wide. If you want, you can take the excess marinade and bring it to a boil, simmer for several minutes, and serve with the flank steak. Great also with salsa or horseradish sauce. The latest innovation in urban farming: fresh spirulina paste being placed into jars in Bangkok. On a hotel rooftop in Bangkok, dozens of barrels of green liquid bubble under the sun – the latest innovation in urban farming. “The algae is growing so fast, normally the doubling time is around 24 hours,” said Patsakorn, whose employer EnerGaia uses Bangkok’s rooftops to grow spirulina. With its high levels of protein and nutrients, “it is beneficial to food security,” he told AFP. would love to know what triggered that reaction in other Mothers. Did Assad use chemical weapons on Syrian Rebels? Has the Tea Party Tiger lost its Teeth? A Community Organizer for the Muslim Brotherhood? Whaaat? to reach across the aisle to get something done. I’ll let you read this article and decide. Senator Lindsey Graham, shown in Washington this summer, has been criticized by some Republicans and targeted by Tea Party supporters. LAKE WYLIE, S.C. — Some of the early shots in the Republican primary battle against Senator Lindsey Graham have been fired from this tiny community on the northern border of the state where the Civil War began. Mr. Graham’s challengers so far in the Republican primary campaign include Nancy Mace, the first woman to graduate from the Citadel. Another challenger, State Senator Lee Bright, tends to support extremely conservative legislation. A small group called Carolina Conservatives United, one of dozens organized loosely under the flag of limited government, low taxes and strict adherence to the Constitution, sent out images last week of a milk carton bearing Mr. Graham’s face and asked Gov. Nikki R. Haley to issue the state’s version of an Amber Alert to find its missing senator. 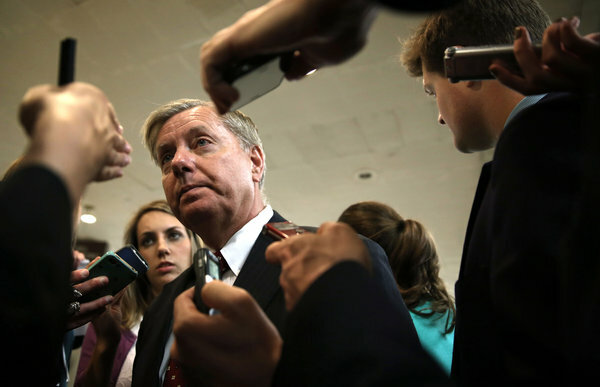 “Lindsey Graham has not been seen in the state of South Carolina for most of the last two years,” said Bruce Carroll, the chairman of the group. Conservatives in South Carolina are eager to oust Mr. Graham, who has enraged the far right for, among other things, reaching across the aisle on immigration and supporting President Obama’s nominations for the Supreme Court. Tea Party supporters called him a community organizer for the Muslim Brotherhood when, instead of heading home for the Congressional break this month, he went to Egypt at the request of the president. But to stand a chance against the politician who succeeded Strom Thurmond in 2003, conservatives will have to win a civil war of their own. At least 40 groups align themselves along Tea Party and Libertarian lines, and trying to unify them to topple the state’s senior senator will be no easy task. So far, three people have stepped forward to challenge Mr. Graham in the June primary: State Senator Lee Bright; Richard Cash, a former Congressional candidate; and Nancy Mace, the first woman to graduate from the Citadel and, at the moment, the challenger whose political star is rising the fastest. Toughing it out at the formerly all-male military college makes her a perfect candidate for voters seeking a true conservative, she said. “I feel like they are looking for someone who is very strong and who won’t waver,” she said in an interview last week. But Ms. Mace is also the biggest target so far, in part because of her connection to a political gossip Web site called FitsNews, which she helped create in her role as a Web designer and media manager. Will Folks, once a press secretary for Representative Mark Sanford and a former political consultant for Governor Haley, runs the site, which consistently attacks the governor. In 2010, Mr. Folks claimed to have had an “inappropriate physical relationship” with Ms. Haley two weeks before the election in her highly competitive bid for governor. The claims were never proved, and Ms. Haley, who is heading into a campaign for her second term next year, has long said it was just another example of underhanded South Carolina politics. Suggestions of a connection to the Web site can quickly throw Ms. Mace off message. The smears, she said, began in Mr. Graham’s camp two months before she announced her candidacy. The others have joined in. One is Mr. Bright, who endorsed Ron Paul in the state’s presidential primary and has used the Web site connection to attack Ms. Mace. He has also been at odds with Ms. Haley over ethics changes and strategies to keep Mr. Obama’s health care law from being implemented in the state. Mr. Bright tends to support extremely conservative legislation and introduced a bill in 2011 to have the state create its own currency if the Federal Reserve system collapsed. She was referring to former Representative Tim Scott, a Tea Party favorite she appointed this year to the Senate seat vacated by Jim DeMint, who left to head the Heritage Foundation. “You got to look at their money, and the guy with the most money is Richard Cash,” Mr. Woodard said. According to recent campaign finance records, Mr. Cash had about $250,000, including at least $200,000 of his own money. Ms. Mace said she raised more than $100,000 in her first two weeks. Mr. Bright has not filed any campaign finance papers. Mr. Graham has $6.3 million. Although he declined to comment on his opponents, his campaign staff pointed out that tough opposition in a primary is nothing out of the ordinary in South Carolina. “Lindsey Graham is a strong fiscal, social and national security conservative with the record to back it up,” said Tate Zeigler, a campaign spokesman. But Mr. Cash is staking out a position as the most anti-abortion, Christian constitutionalist in the race. He is certainly the most seasoned campaigner among the challengers, even though his first race was not until 2010, when he was one of six Republicans trying to capture an open Congressional seat. Although he was not well known, he ran a disciplined campaign that moved him into a runoff against Representative Jeff Duncan, Mr. Woodard said. In meetings with Tea Party groups, Mr. Cash repeats a carefully honed slogan about his candidacy, which he says is built on three C’s: capitalism, Christianity and the Constitution. The state’s traditional Republican leaders and political consultants say that it will take a deeply unified effort to mount a successful campaign against Mr. Graham, but that in South Carolina, an unpredictable state with one of the country’s largest number of prominent Tea Party politicians, it is not unthinkable. The key is for one candidate to find a way to harness that power. “Anybody who wants to look at all those groups with a broad stroke should think again,” said Matt Moore, the chairman of the state’s Republican Party. This summer, dozens of conservative groups talked about finding the state’s Ted Cruz — a reference to the Texas senator whose long-shot, grass-roots victory in 2012 is considered a model among Tea Party supporters. It remains to be seen whom that should be, said Paul Anderko, the president of the GPS Conservatives for Action PAC. story. Was the Congressman wrong? At a town hall in Mursfreeboro, Tenn., 11-year-old U.S. citizen Josie Molina approached the stage to ask anti-immigration reform Congressman Scott DeJarlais (R-TN) whether there was anything she could to do stop her father’s imminent deportation proceeding. “I have a dad who’s undocumented and what can I do so that he can stay with me?” she asked as her voice trembled. But when DesJarlais broke the news to her that “we have laws that we need to follow,” the crowd broke into rousing applause. DesJarlais fielded questions about undocumented immigrants who want to serve in the military and from so-called DREAMers, who are undocumented youths brought to the country by their parents. But at all times, DesJarlais remained adamantly opposed to immigration reform, each time making border security and law-breaking the focal points of his argument. When Molina asked her question, DesJarlais responded just the same. JOSIE MOLINA: I have a dad who’s undocumented and what can I do so that he can stay with me? REP. DESJARLAIS: Joanna, thank you for being here and thank you for coming forward to speaking to us. This is a big intimidating crowd, and I appreciate you coming forward to ask your question. But the answer still kind of remains the same that we have laws and we need to follow those laws and that’s where we’re at. According to some reports, both Tea Party members and numerous immigration advocates attended the packed event. But it was the Tea Partiers who applauded when DesJarlais told Molina that people need to follow the law. But the law is not as cut and dry as DesJarlais suggests. The Obama administration implemented a policy to limit enforcementthat includes consideration of whether an individual has a U.S. citizen child or spouse. The policy also allows Immigration and Customs Enforcement (ICE) agents to focus deportations on criminal immigrants. The immigration bill that passed the Senate would provide a path to citizenship for many undocumented immigrants, and allow parents to make decisions about their child’s care before they are deported. The bill is pending before the House, with many Republicans like DesJarlais withholding their support. In the absence of such reform, more than 205,000 parents of U.S. citizen children like Molina, have been deported between 2010 and 2012. A dog gets a chiropractic assessment at the Tufts University School of Veterinary Medicine. Still, the practice remains controversial, in both people and pets. While some studies have found that chiropractic care can be more effective than medications for people with problems like neck pain, others have linkedforceful neck manipulation to strokes. Other researchers have found that unfavorable chiropractic outcomes are under-reported in medical trials.